The flight from Los Angeles to Sydney was uneventful. The stewards and stewardesses were much more efficient and professional than the ones I had encountered on the Atlanta to Houston leg. That reminds me! Typically, I like to get our seats in the back of the plane. Needless to say, this implies that we are the among the last passengers being served by the stewardess. As usual, we were waiting our turn and I had decided to request the “illy” coffee that was being hyped in the United flightzine. Halfway along the flight from Atlanta to Houston, we encountered some turbulence. At this point, the stewardess was in the process of serving drinks. After stabilizing herself, she continued along the aisle (coming towards our row, that is). I was still hopeful of getting my taste of “illy”. But then the captain came on the intercom and said that he was expecting to hit some more turbulence up ahead and that he was calling for a suspension of flight service in five to ten minutes. Guess what? The stewardess shut shop rightaway. I had hoped that at least she would continue with her service until the captain’s next announcement, and so did some of the other passengers. But after that, we had nothing for the rest of the flight. In fact, when a couple of us stood up to go to the restroom, she sat us right back down, which was OK, had she been consistent in her behaviour. Oh well, illy coffee illa (no coffee here)!! To complete the tale, I did seek and get the coffee on the next leg, and did not like it. What an anticlimax! Where was I? Yes, I was saying that the flight crew was much more efficient on the flight from Los Angeles to Sydney. Baab and I like the Boeing 787 Dreamliner. Maybe it is just me, but it does appear to be bigger than those on other planes. At least, I don’t bump into the walls as often when I am in there! We encountered an issue with our food though. Three of our family got our Asian Vegetarian Meal, where the food is excellent Indian fare, but the dessert leaves a lot to be desired, as they go completely vegetarian on us, and more often than not, dessert consists of fruits. But the fourth, Mrs. Porcupyn, did not get the AVML that I’d requested. The flight crew informed her that she was not listed as having requested a special meal, which I did not really understand. Fortunately, she was able to get the pasta meal which was also vegetarian. I wondered if I had made a mistake and not requested an AVML for her – more on this later. As I dozed on and off, I tracked our flight as it went past Hawaii’s latitude, then entered the Southern Hemisphere (a first for everyone in the family), then passed exotic sounding cities such as Nuku’alofa and Niue. After a long time – this flight rivals the non-stop ones from India or the Middle East to USA – I started seeing the coastline of Australia appearing on the map showing Cairns to the north and Melbourne to the south. 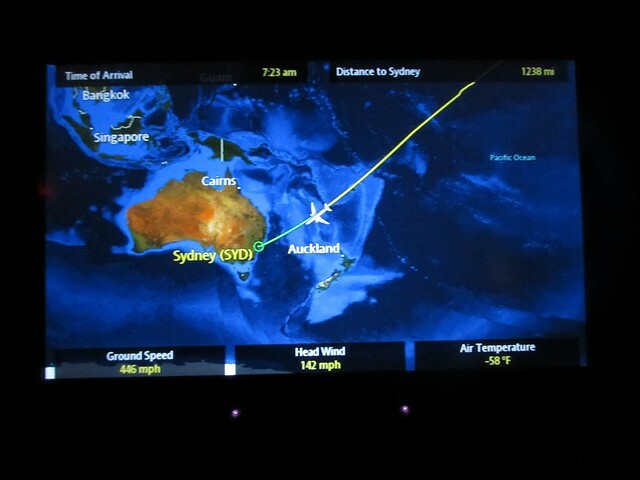 Finally, the captain announced that we would be landing in Sydney shortly. I looked out and finally saw land for the first time since we had left Los Angeles. 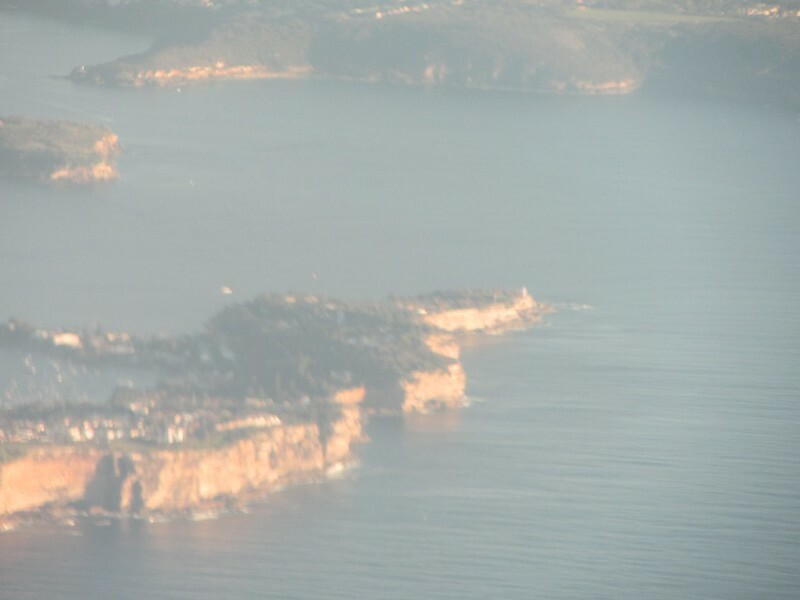 We flew right over south east Sydney and I saw all the major Sydney landmarks that I had researched – famous beaches such as Bondi and Coogee (which I misidentified from the air), Watson Bay (and its lighthouse), the Double Bay, and of course, the famous iconic sights of the Opera House and the Sydney Harbour Bridge. 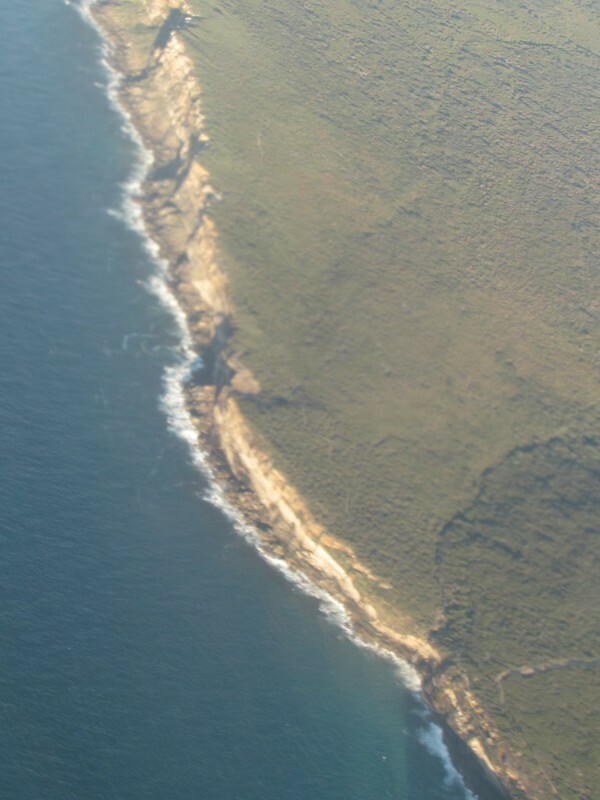 The plane then banked steeply and turned left (south) and out into the sea once more. I could see the sharp cliffs that were being hit by the waves relentlessly. With one more turn, the captain aligned the plane for landing and we touched down just under half an hour late, not bad considering that we were delayed by over an hour ex-LAX! On a Thursday, I came home early from work, by which time the rest of the family was already home. The kids, I repeat (though I don’t think I mentioned this earlier), were still not really thrilled as they would be missing their first week – plus two days – of school as a result of this Australian adventure. Rather reluctantly, therefore, they worked at packing their luggage. By the time we were all packed up and ready to leave, it was past seven pm, and we had originally planned to leave by five, so as to get to our Atlanta hotel by midnight. As it happened, we did not get in there until nearly three am – and there is a reason why!! Given the latest advances in technology, which I had not embraced yet but DS had taken to like ducks to water, I neglected to look up Google Maps before leaving to note down a back-of-the-envelope (literally!) map that I typically draw when I am driving to an unfamiliar destination. Instead, I had asked Baab to get the travel route all sorted out, which he did. Once we got into the general Atlanta area, it was about 2 am. We were still on I-75 in the general neighborhood of the hotel. At this point, the GPS informed us that the destination was about 30 minutes away and indicated that we should be leaving the interstate. We followed the directive. What followed for the next 30 minutes were right turns and left turns and right turns … you get the point! We were driving around on little side streets in the middle of the night with not a soul (or house) in sight that we could see even on a moonlight night! We called the hotel’s number but the clerk was not really sure if we were on the right track – she could only read us out the official directions which required us to take an exit off I-85!! At this point, we got severely nervous as we had no clue what we would do if the car developed an issue. Fortunately, it didn’t and, like I said, we reached the hotel almost at 3 am. Though the GPS was exactly right, looking at the map later, I realized that I was right in guessing that the hotel was somewhere in the V-region formed by the two interstates. Instead of taking us all the way to the junction and bringing us back, it decided to take the shortest route (based time or distance or both), but it was not the most inhabited route for sure. Oh well, lesson learned … almost. Why? Read on in later posts. For now, we were in Atlanta and all checked in – we had one check-in bag between the four of us and four carry-on bags and four back-packs. The idea was that we would dump all the food (TV dinners, cookies and the like) and warm clothes in the check-in bag while travelling, but then – once in Australia – rearrange our stuff and leave the nearly empty check-in bag with friend in Sydney. Two things were making us a bit nervous – the first was Australian immigration and the second was our flight connection at LAX. In researching Australia, I had chanced upon some YouTube videos of folks being caught taking undeclared food (a big No No) into the country. In addition to losing their food item(s), the passengers had to pony up a significant amount for fines. Some visitors were deported back for not adhering to the rules of the visa that they came on. I also read about shoes being banned from Australia as they had dirt on them. Needless to say, we were worried that we might fall foul of the law with the food items that we were carrying and also that our (hiking) shoes might not be clean enough for Australia, as we had worn them in Switzerland last year. 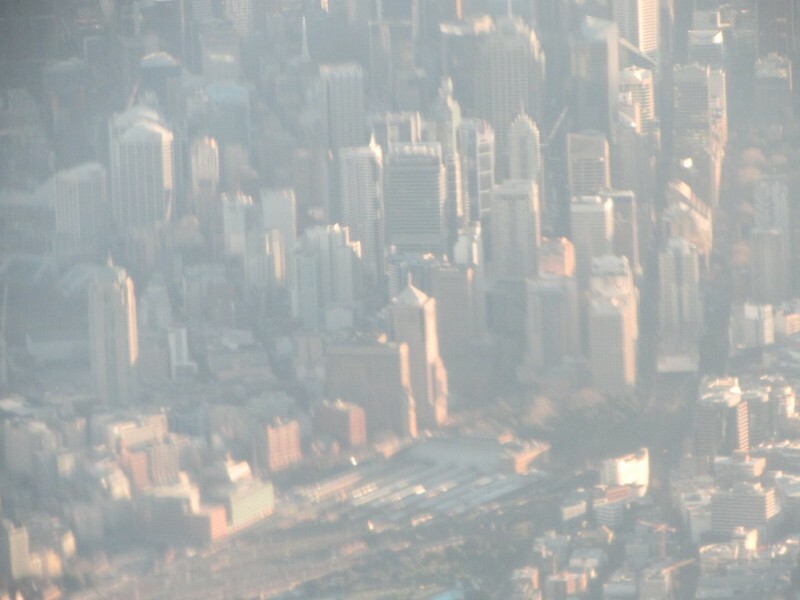 Then there was our flight connection – so careful I was in getting our flights on the right dates, that I did not pay enough attention to the actual flight timings and connection times. As a result, we had over six hours of connecting time at Houston International (IAH), followed by 45 minute connection in Los Angeles (LAX). I called United, I talked with an agent at a booth in a mall in New York – everyone assured me that as it was a published connection, we would not miss it. However, researching the flights online, we noticed that the IAH-LAX flight we were on routinely late. To add to our worries, Baab informed me that there would be quite a bit of walking involved across terminals in LAX, and we were unsure whether we would be subject to another round of security as well. All in all, we were antsy even though the research also indicated that the LAX to Sydney (SYD) flight was also late on the days when the IAH-LAX flight was late! To add to our worries, a couple of days before we were flying, Delta had major issues with their computer systems and a lot of their flights were grounded in – of all places – Atlanta! As it turned out, we were vindicated (a little) for our concerns. ATL-IAH was on time, and we spent the long transit time just hanging around (three of us) and checking out planes and taking photos (Baab). Baab and I went from the domestic terminal to the international terminal and back in the shuttle trains within Houston. However, the IAH-LAX plane took off a bit later than its time, though the pilot assured us that the flight would be reaching on time. And he was right, as we landed at LAX ten minutes ahead of schedule. I was so glad that I heaved a sigh of relief. Not so fast, buster! We taxied for a few minutes then ground to a full stop on the tarmac, well short of any gate. Then came the announcement that our gate was occupied by a plane and we would get there as soon as the gate was available. After ten minutes more of waiting (now we were past the scheduled time and so, officially, we were late), another announcement followed which mirrored the previous one. Now, I was positively worried. I called the flight attendant and asked her if she knew anything about our flight out to Sydney. She went back to check and came back in a couple of minutes to tell me that it was on time. As we had still not started moving, I requested her to arrange it so we could leave the plane early as we had a really tight connection. She said that she would make an announcement. Sure enough, when we finally got to the gate nearly 30 minutes behind schedule, she requested folks to make way for families behind them (we were almost at the last row) who had to rush to catch a flight. To no one’s surprise, nothing like that happened. Not only us, but also another family immediately ahead of us who also claimed that they had a tight connection, was able to get ahead of the crowd. And so, when we finally entered the terminal building, it was almost time for the Sydney flight to take off. Leaving the rest of the family to walk slowly, I almost ran all the way to the Sydney flight (gate 74 in Terminal 7, IIRC) from our gate (85 in Terminal 8, I believe). When I got there, I was relieved to see that the door to the jetway was still open, though there was no sign of any of the other passengers who had obviously all gone in and occupied their seats. As I had the passports and boarding passes for everyone in the family, I quickly got them all verified by which time, the rest of the family showed up and we were able to get in the flight. As an anti-climax, we had to wait for another half an hour or so – and more passengers to come in – before the flight finally took off (though the pilot blamed the delay on some mechanical issues). Day One: Land in Sydney, get picked up by friend who would give us a highlights tour of the city, so we could get a few scenic photos, after which he would drop us off at the airport for our evening flight to Cairns. Once in Cairns, we would take our rental car and drive to our first Airbnb accommodation that was conveniently located close to the Wharf. Day Two: Early in the morning, we planned to drive in the car to the Wharf, find a parking spot, then head over to the Marina to get to our Cruise to the reefs. Once done with that adventure, we would drive to our second Airbnb accommodation that was outside of Cairns town and appeared to be in a remote location (which is why we didn’t reserve it for two days – even hindsight doesn’t help us figure out whether this was a good decision or not!). Day Three: We would wake up late and at leisure, relax and just hang around, before leaving to Cairns to return our car then board the plane for Melbourne. At Melbourne, we would once again head towards the rental agency, get the car and drive to our third Airbnb of the trip in Torquay, at the origin of the Great Ocean Road. Day Four: We planned to leave early in the morning (maybe not as early as Day Two and definitely not as late as Day Three) and get on the Great Ocean Road. Our farthest point planned was Port Campbell after which we would head back. However, though the distance is about 150 km (less than 100 miles), we had been uniformly warned on all websites that it would take much more than your regulation two hours or less! So, we didn’t have a clue how far we might get that day. Chances were we would not yet reach Port Campbell; on the other hand, there were good chances of our going all the way up to Port Campbell way before sunset then starting to head back towards Melbourne. Be that as it may, we decided not to take the chance of reserving our accommodation and then either not arriving in time (then struggling to drive on the “opposite side” at night) or overshooting it (then regretting the time lost by dragging ourselves back). So, we didn’t have any reservations for that night. Day Five: Picking up wherever we left off, we would drive the remainder of the GOR up to Port Campbell, then take the inland (much faster) roads back to Melbourne. After spending the morning and early afternoon sightseeing Melbourne, we would drive to Phillip Island to watch the little penguins. After watching them, we would drive the rental car back to the airport to return it to the agency. This is how I figured the two days “plus three hours” of rental. I figured that we would be renting the car at about seven pm, and then – two days later – the penguins should be coming home by about the same time. Figure about a couple of hours plus some extra time, and we should be able to drop the car off by about ten pm or so. Once that was taken care of, we would get some transportation – either a shuttle or a cab – to Melbourne CBD and our ho(s)tel for the night, Urban Central Accommodation. Day Six: In the morning, we planned to get up early, check our luggage into the luggage room at the hotel, then check out of the hotel. We would then spend the whole day sightseeing in the Melbourne CBD area (I really did not research this a whole lot) and maybe go to the top of the tallest building in the Southern Hemisphere, the Eureka Skydeck. Late in the afternoon, we would return to the hotel, relax for some time, pick up our luggage then head over to the train station for the train that would take us to Sydney. Day Seven: Once we got to Sydney, my local friend would pick us up and then we would be going to visit the Blue Mountains with his family. That night, they would be hosting us at their home. Day Eight: In the morning, our hosts would take us to the Intercontinental Double Bay where we would at least leave our luggage if we couldn’t check in. They would then drop us off at either end of the Coogee Beach to Bondi Beach cliff walk, which is one of the famous attractions of Sydney. Once we finished the walk, we would head over to Sydney CBD area where we would spend some time in the Circular Quay area before taking the Manly Ferry, which would give us great views of the Sydney CBD area, especially the Opera House and the Harbour Bridge. Later, we would spend some more time in the Sydney CBD before returning to the hotel. Day Nine: As our flight out was in the morning, we wouldn’t really have much time to do anything except to get ready and hail a cab. OK, let me start at the very beginning. So, thanks to the information on Clark Howard’s website, I managed to purchase our travel tickets to Australia from Atlanta (not Central Florida) for less than half of what I had ever expected to be paying for those tickets. However, that was just the start – we still needed to figure out where to go and for how long! At the very outset, Mrs. Porcupyn washed her hands off the planning aspect – and justifiably so, as she is very busy with her job and the kids’ extra curricular activities. So I did the next best thing and co-opted Baab into the planning process. The pre-planning was a good thing as not only did it help us put together a decent itinerary, but it also helped us greatly in understanding the lay of the land. From the get go, we set our sights on Sydney and Melbourne as our two bases as a trip to Perth was out of the question. I priced out car rentals and reserved a car for the week for nearly A$500!! As I could not even place any of the Australian cities on the map at this point, I delved deep into the recess of my mind for my high school geography knowledge of the continent. I recalled that the tallest mountain in the continent was not too high. So, the plan was to hit Mount Kosciuszko enroute to Melbourne then drive back. But one email to Sydney based friend convinced us that it would be a bad idea because a) the mountain would be snowbound which would make driving hazardous for us and b) half of Australia (OK, I am exaggerating here) would be there with their snow gear! Next, we looked towards Darwin with its beautiful waterfalls, tropical forests and weather, and lush scenery. However, after a review of the amount of time needed and the travel costs, we abandoned that plan. Our next choice of destinations was Uluru (Ayer’s Rock), so much so that I even reserved accommodation and almost purchased the flight tickets; however, upon further review of the amount of time it would take out of our trip just to get a photo or two with a rock in our background (granted, that is one silly way of looking at it as the area really does have some singularly unique scenery), we had to cancel that plan as well. Then, we turned our attention to Brisbane, with the nice river that flows through the city flanked by parks with wildlife and a petting zoo area with Kangaroos as well as Koalas. Also, by this time, DS had researched about the NSW Discovery Pass on trains, which was a nice perk for both of us, as we are diehard trainfans. The pass allows for unlimited travel between the cities of Melbourne and Brisbane, and also included the trip up to Katoomba for the Blue Mountains. Even if we purchased the 14-day pass and used it for the seven (full) days we were there, we would be able to recoup its cost. However, in the end, looking at the amount of time we would spend in the train, we decided it would not be worth it to subject Mrs. Porcupyn and Katya to that torturous experience! Now that even Brisbane was dropped, we looked for other touristy things that smacked of Australia! Lo and behold, the Great Barrier Reef beckoned. Cairns it was, though hindsight being 20/20, a better choice probably would have been somewhere closer to Brisbane, say the Whitsundays area. On the other hand, the second night we were in the Cairns area was one of the best of the entire trip. So, in the final analysis, it did turn out well. Besides these, I reserved cars at Cairns for two days and Melbourne for two days plus three hours (why the “plus three hours”? Hold on to your horses, this is just a sneak preview). For the two JetStar flights, I pre-purchased 20 kg of checked-in baggage per adult as well as window seats for each kid right behind each other. As JetStar had a stated policy (don’t know how well they follow it – details will follow later) that they would seat an adult next to a kid when they traveled together, my rationale was that at least we would all be in two consecutive rows, and we would still get to look out through the window. For the outbound (to Cairns) flight, I had purchased two window seats on the right side and for the flight in the other direction (to Melbourne), I had purchased two window seats on the left – with the hope that we would be able to see the reefs from the air. To fill in the gaps, we were unsure where we would be halting on the fourth night, so we kept our options open. The sixth night we would be spending on the train from Melbourne to Sydney, and the seventh night, our Sydney friend had offered to host us. In addition to all this, I forgot to add, we got our Australian visas (I am referring to the version for US citizens) through their online site. Apparently, there are ways around it (i.e., sites that apparently can get you your visa for less than the officially approved site – this is because the visa itself is free but the agency charges for their legwork), but per online advice, better be safe than sorry and so, we paid up the A$20 per person. 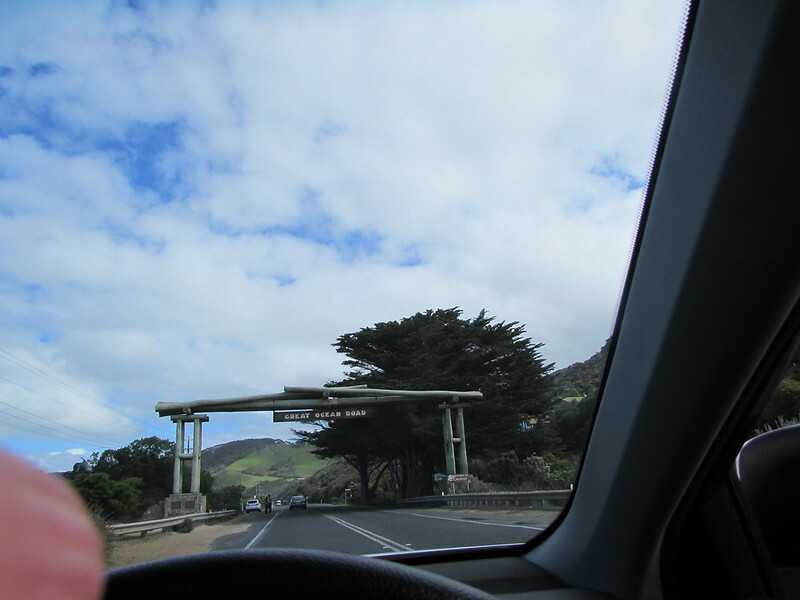 “So, we are finally here at the Great Ocean Road,” I thought, as I took this photo. It had been nearly a year since a co-worker had returned from a visit to Australia for the Australian Open. He had shown some great photos of the Great Ocean Road as well as the Melbourne area. Needless to say, a desire to visit the area had been awakened. My initial research had led me to believe that round-trip tickets could be had for no less than $1500. I concluded that there was no way I was going to visit Australia – that chance had slipped through my fingers the minute I boarded that first flight westbound to the USA for graduate school from India a long time back. Imagine my excitement when, one April morning, I checked Clark Howard’s website and found out that fares to Australia were available for less than $600 ex-Atlanta! We were looking at a busy summer ahead of us. Waves of relatives were planning to visiting us for a day, week or month. In between those waves, we had hardly much time to spare. Given that it takes about a day of travel to get to Australia (and another to return), I really wanted to spend at least two weeks in Australia. However, there was no way I could see us managing that much time what with school commencing within a couple of days after the last of our visitors left. So, I did the best thing I could and sounded out Baab if he would be OK with missing a week or so of school in return for a trip to Australia. While he was thrilled at the prospect of the trip, he did have some misgivings about missing class. Nevertheless, he said OK. I met with stiff resistance with the rest of the family though. Mrs. Porcupyn and Katya were not in favor of making the trip. After a lot of cajoling, I managed to convince them that spending a week in Australia would not be the end of the world! The trip almost got shot down a second time when I had to (parenthetically) add that it would entail a seven hour drive before and after the flights! Just before I bought the tickets, I had this thought about the weather! Whoops, I said to myself, it would be winter there … and winter there would be cold, wouldn’t it? Now look, at this point in time, I had no clue how far down south Australia was (though Geography was one of my pet subjects in school, every now and then I get this little nugget of information that I never knew before) nor where each of the big cities was geographically located – though I at least knew their names. Some quick research convinced me that it would probably be no colder than Paris had been during Thanksgiving time (November), which is when we had spent two days there! So, I went ahead and purchased the tickets, though it took more than a day for it all to sink in, by which time I had a) received the ticket information and b) called United and confirmed that everything was A-OK with the tickets!